The first white men to see the San Bernardino mountain range were deserting Spanish soldiers from the San Diego Mission. They were pursued by Captain Pedro Fages and his troops. Some of the defectors escaped but others were captured. The first white man to cross these mountains was Father Francisco Garces. Coming from the desert side, he followed the ridge west of Devil’s Canyon and into the Big Bear Valley. Padre Dumetz established a supply point and an alter on May 20 in an area he named San Bernardino because it was the feast day of St. Bernard of Sienna. The entire area was rocked with repeated earthquakes resulting in a bloody Indian uprising because they thought the Great Spirit was angry with the Padres. 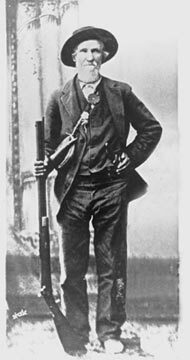 Benjamin Wilson leads a posse of 22 men into the San Bernardino Mountains to search for Indians who had been raiding ranches in Riverside. He discovers Big Bear Valley and gives it the name it has today. Up until 1845, Bear Lake was known to the local Serrano Indians as Yahaviat, which means “Pine Place”. 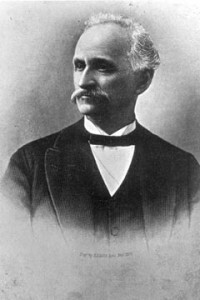 Benjamin Wilson is credited for giving Big Bear Lake it’s name. Among his other accomplishments he would later become Los Angeles first mayor. The Mormon settlement of San Bernardino began on June 11th when Captain David Seely led the first 50 of 140 wagons and 437 people to a camp at Sycamore Grove. On September 22nd the Mormons bought the 35,000 acre Rancho de San Bernardino from the Don Antonio Maria Lugo family for $77,500. Mormon Lumber Road is built up West Twin Creek to the top of the mountain near today’s Crestline. First steam sawmill was then set up by Charles Crismon in Twin Creek Canyon using the boiler and engine from the Salt Spring Gold Mine which was abandoned because of Indian attacks. 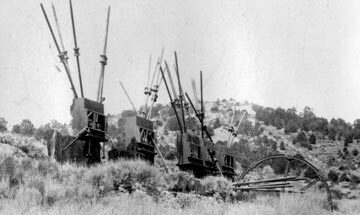 First gold reported found at Big Bear Valley, but water was scarce to mine it. First recorded mining in Big Bear Valley was underway at Starvation Flat (near the intersection of Division and Big Bear Blvd. today) by Joe Colewell and his party of six miners; Jack Elmore, Bud Bryant, Madison Cheney, Jim Ware, Sam Kelley, and Jesiah Jones. Bill Holcomb and Jack Martin join the Colewell party at Big Bear Valley in the late fall. Bill Holcomb starts a Gold Rush in Big Bear in 1860. In late April, Bill Holcomb and Ben Choteau went to Holcomb Valley prospecting. Testing a sample, they found paying gold in Carribu Creek. On May 5th the group located the first mining claims in Holcomb Valley, and started Southern California’s largest gold rush. The first 4th of July in the new mining camp was celebrated with the help of blacksmith Jed Van Dusen’s wife, who fashioned an American flag from a miner’s shirt and a dance hall girl’s skirt. The town of Belleville was named after her daughter, Belle, by the grateful miners. The population was soon over 1000, and in the November election Belleville missed becoming the county seat by only two votes. First road into Holcomb Valley completed by Jed Van Dusen using $1500 contributed by the miners. It connected with John Brown’s new Cajon Pass Toll Road near present Hesperia. Last Indian battle in Southern California ended at Chimney Rock above Rabbit Lake in February, after 32 days of fighting. Late in November, Barney and Charley Carter discovered gold nuggets in an outcrop they staked as the Rainbow. This would eventually become Lucky Baldwin’s Gold Mountain Mine at the east end of Big Bear Valley. Elias J. “Lucky” Baldwin started a second Gold Rush in Big Bear with the construction of his 40 stamp mill at Gold Mountain. Fighting five feet of snow, Sam Baird and four carpenters started construction of a house and blacksmith shop at the Gold Mountain Mine. Spring found Judge Wagner surveying a town site on the flat below the mine. Over time it would have four names: Bear Valley, Gold Mountain City, Bairdstown, and Doble. Machinery for Baldwin’s new ore mill arrived over Van Dusen’s old road through Holcomb Valley, and a new shelf road built by Chinese labor around the south end of Jacoby Canyon. All was installed and under cover by the years end. Chinese crews also built a 5 mile long wooden flume along the mountains on the North side of Big Bear Valley, to bring water from Van Dusen Canyon to the stamp mill. At 3:30 p.m. on March 8th, E. J. Baldwin’s new $250,000 forty stamp ore mill at the Gold Mountain Mine was started up with he, other dignitaries, and 180 visitors and guests looking on. The ore ran $70 a ton. The pounding of the stamps could be heard all over Big Bear Valley. Fifty homes and stores were being rushed to completion at Bairdstown to provide for the needs of the miners, mill men, merchants and their families. August 26, “Black Friday”, saw the collapse of Comstock Lode mining stocks in San Francisco when $100,000,000 in paper value vanished. 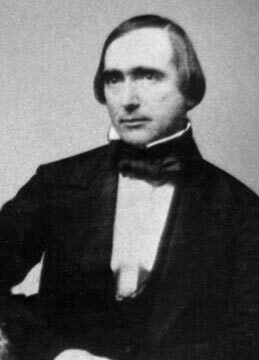 William Ralston’s suicide, the closing of the Bank of California, and the resulting financial chaos had drastic effects on both Lucky Baldwin and Senator J. P. Jones’ fortunes. The Gold Mountain Mine was closed. The big stamp mill at Bairdstown ran intermittently, but the boom was over and most of the town’s population had gone. Only eight voters cast their ballots at the November election. The burned out ruins of Lucky Baldwins 40 stamp mill at Big Bear. At 2 0’clock in the morning of August 11th, the huge Gold Mountain Mine stamp mill mysteriously caught fire and burned to the ground, a loss of $80,000. Gus Knight, Sr., was the first to go into the cattle business in Big Bear Valley. His ranch buildings were at the southern end of Shay Meadow where the present rodeo grounds are located. Indians stole some of his cattle that first year, and 17 years later he received $8,000 from the Indian Agency to settle the claim. James Smart homesteaded 160 acres in the Moonridge area for a cattle ranch. Returning to the mountains with a new JS branding iron, it fell from his saddle. The tip of the J was broken off which created the IS brand that would endure for almost eighty years. Early in May, Frank Elwood Brown and Dr. Wellwood Murray of Redlands were lead through the San Bernardino Mountains into Big Bear Valley by their guide Hiram Barton. When they reached the narrow gorge at the west end of Big Bear Valley, Frank Brown new that his dream of a perfect location for a large reservoir to supply water to thirsty citrus farms in Redlands had been realized. He immediately returned to Redlands, and began taking steps to get a dam built. 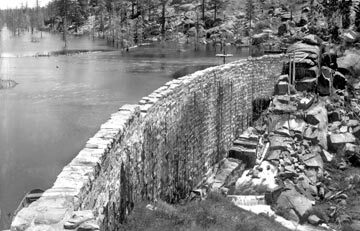 Frank Brown begins construction of a single arch rock dam across the west end of Big Bear Valley in late summer. Frank Brown’s new rock dam. At that time, Big Bear Lake was the largest man-made lake in the world. Construction of the rock dam was barely finished by December when a blizzard hit, sending the work crews home for the winter. They planned to return in the spring to finish the concourse across the top of the dam, but that never happened. The top concourse was never completed. The new rock dam was 300 feet long, and stood 60 feet high above the stream bed. It held 25,000 acre feet of water. First water from the Bear Valley Reservoir flowed into the Redlands distribution system on July 10th. It only took Frank Brown 26 months from the time he first saw the dam site in Big Bear until he was delivering water to Redlands orange groves-a truly amazing accomplishment.